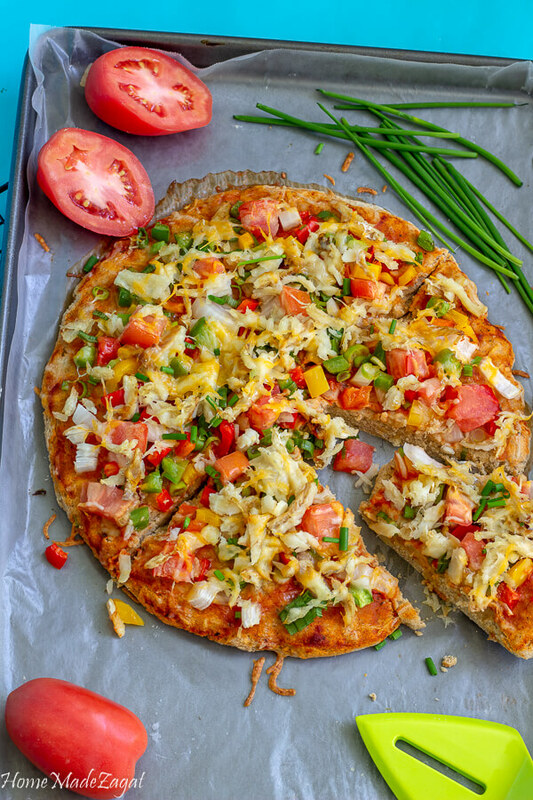 A play on the best Caribbean breakfast combo of saltfish buljol and coconut bake. 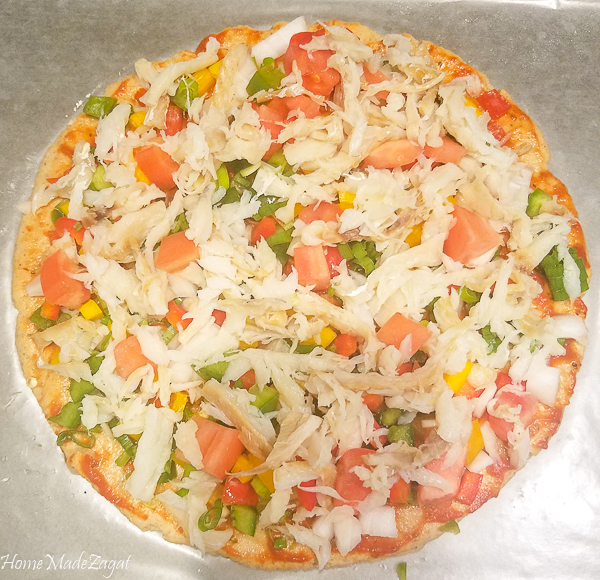 This pizza had all the delicious saltfish flavor mingled with the familiar flavors of everyone's favorite guilty pleasure: pizza! Another month of Callaloo Box. For September they paid homage to one of the most loved condiments in the Caribbean, the coconut. The coconut is the heart of not just Caribbean cuisine but also of Caribbean culture. I mean, have you not seen a million pics with people posing somewhere in the islands with a fresh 'nut about to drink some coconut water?. Coconut trees line the beach fronts. Swaying while standing tall on the sands. Varying in color from the green to the yellow. Even seeing some of what we call the "Chinese" coconut, with its hue of orange. We use them for food, from sweet (coconut tart, sweet bread) to savory (in stews, curries, soups, to make bake). To make drinks - coco loco, gully wash. To make oil, milk, and charcoal. Parts of the trees make brooms, brushes, mats. We are definitely a set of coconut using people. So seeing a vast array of things in this box was no surprise. 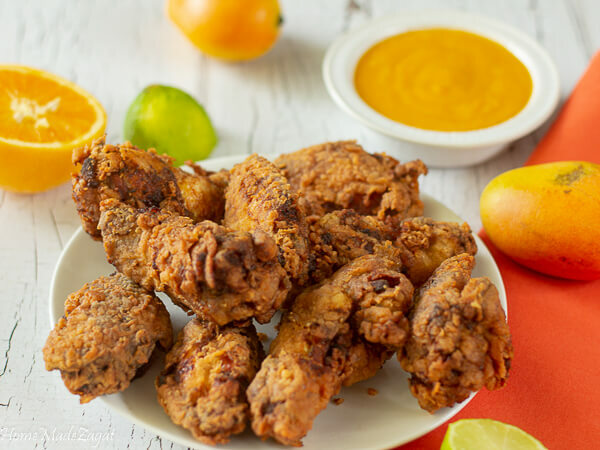 For this recipe, I decided to try out the coconut flour. I decided to make a pizza. And not just any plain old pizza. There is a popular breakfast option in the Caribbean called saltfish buljol. It is most times commonly paired with coconut bake or with fry bake. 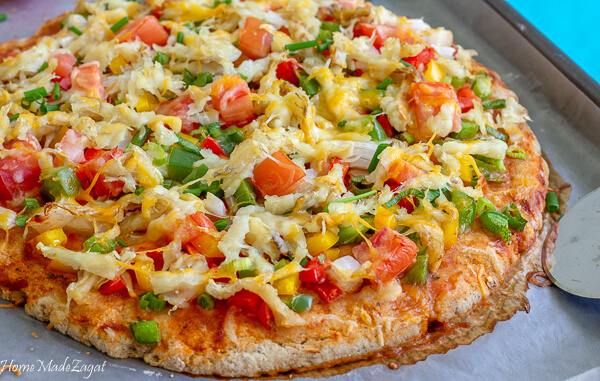 In fact, saltfish buljol and fry bake may just be an all-island favorite. 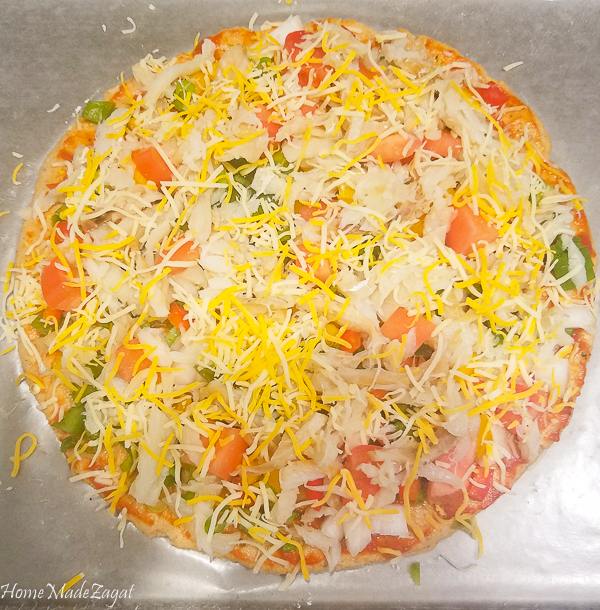 So here I am putting a different twist on this quintessential breakfast and making it into a pizza. Another plus to being a coconut region. 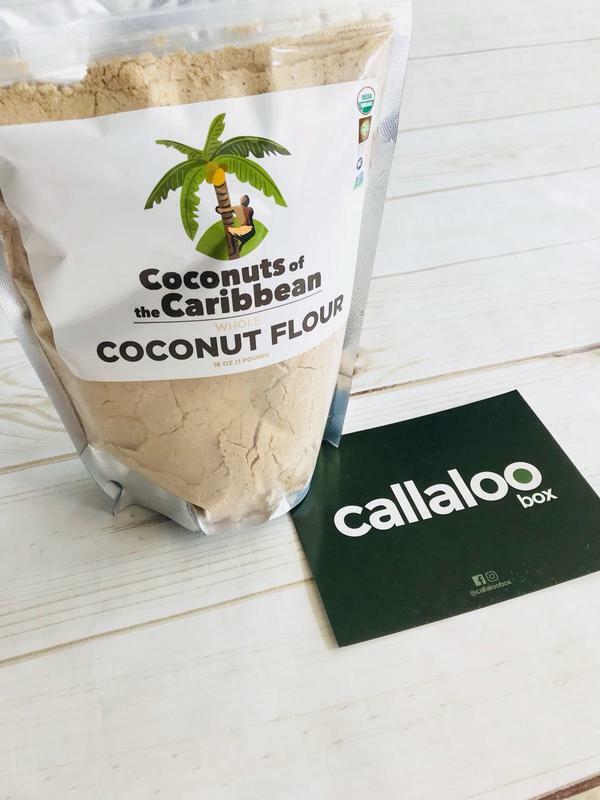 The flour is made from ground and dried coconut "meat". The dry coconut is grounded and strained (separating the milk from the dry husk which will be the "flour"
It is then baked at a low temperature to dry out any moisture and it creates a powdery entity that is the flour. Just plain, dried coconut. 1. Helps with metabolism since it has a high level of saturated fats. 2. High in fiber and helps toxins and waste to move quickly through the body. 4. Helps digestive health. Some studies have shown that coconut flour can lower the LDL cholesterol (bad cholesterol) levels in people who suffer from high cholesterol. Things I learned with using this flour. Coconut flour is very absorbent. The package says to substitute regular flour with about 30% coconut flour. 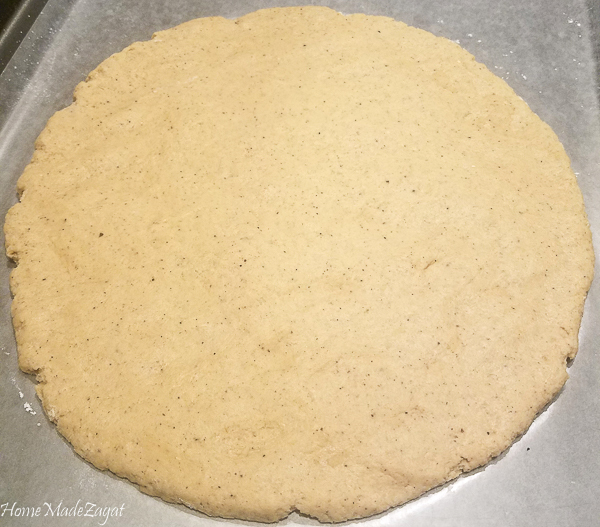 I was a bit worried when I saw the mixture not getting to a texture that would allow me to roll it out or even use the push method to get the pizza dough out. Then I decided to use a binding agent. I decided on an egg first. Yes if that didn't work then I would have to figure out something. But the egg was good enough. Letting it sit and bind together for a little bit also helped with getting that texture I wanted. I pushed out the dough. This is simply taking the ball of dough. Placing it at the center of your sheet and working from the center of your dough, push it outward while spreading your fingers. The dough moves out to a disc shape easier for me than trying to roll it out with a rolling pin. Another tip was baking the crust prior to adding the toppings. This helped a lot in making sure that the center of the dough was baked to perfection. Coconut flour doesn't act like regular flour. Placing the toppings on with the dough without pre-baking, required a little longer baking time and created drier toppings in the end. I suggest putting the saltfish on last (well just before the cheese). This ensures that if by any chance there is any moisture left with the saltfish, it wouldn't make the dough too soggy. If that does happen, it will take longer for the dough to bake. So try your best to get as much of the water out of the saltfish. A helpful hint is to place the saltfish on a paper towel after removing the excess salt. I know. 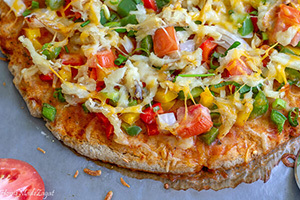 Saltfish buljol doesn't have any cheese in it, but pizza does. And since it's a marriage of the two I needed my cheese. Plus I am cheese obsessed sooo. I think I ate this mostly alone if I think about it. I loved that there was this fresh coconut taste and feel with the flour. This really created that bake and buljol feel in a new way. I found the dough easier to cut than plain flour crusts. It was definitely firmer out of the oven. That pre-baking probably helped with that. This was a good marriage between turning something old into a new form. I don't think we stepped too far away from the traditional dish. Especially when it came to taste. 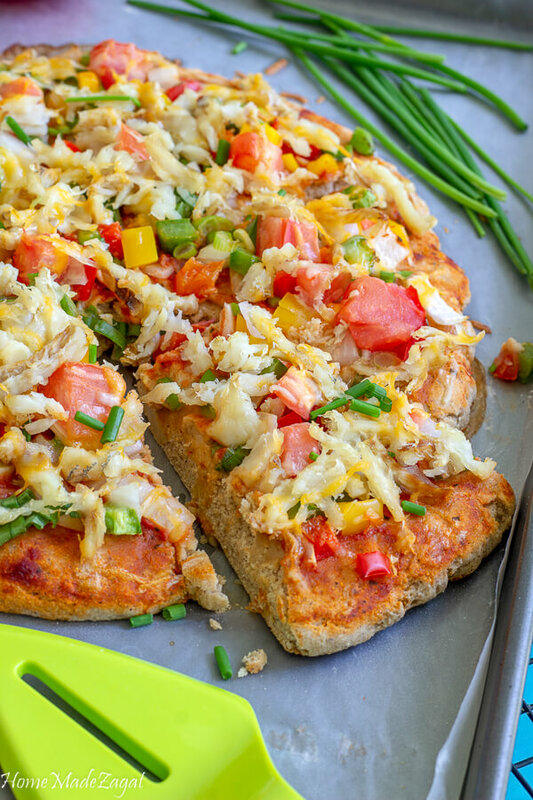 It's like an open face bake with salt fish on top. 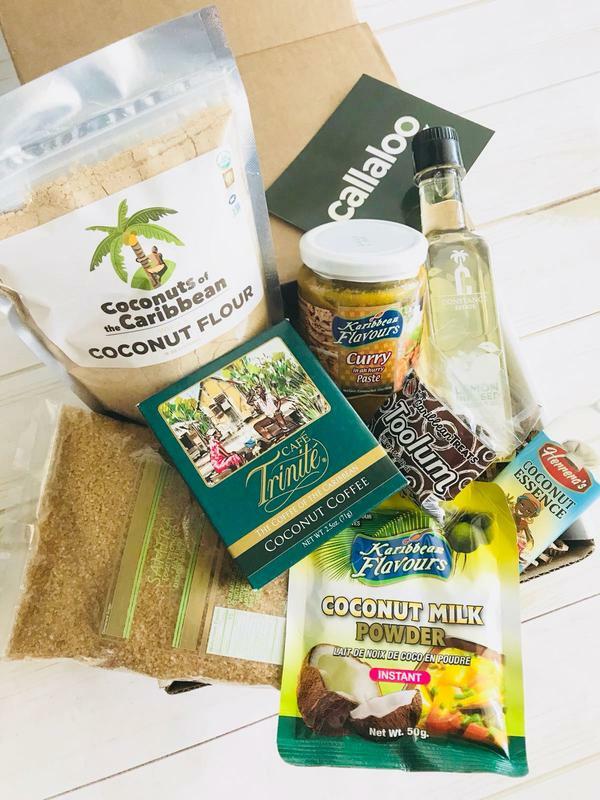 Make sure and check out the other things in the Coconut Box for September. The "curry in a hurry" is a winner for me. Feel I will be doing a recipe with that soon. 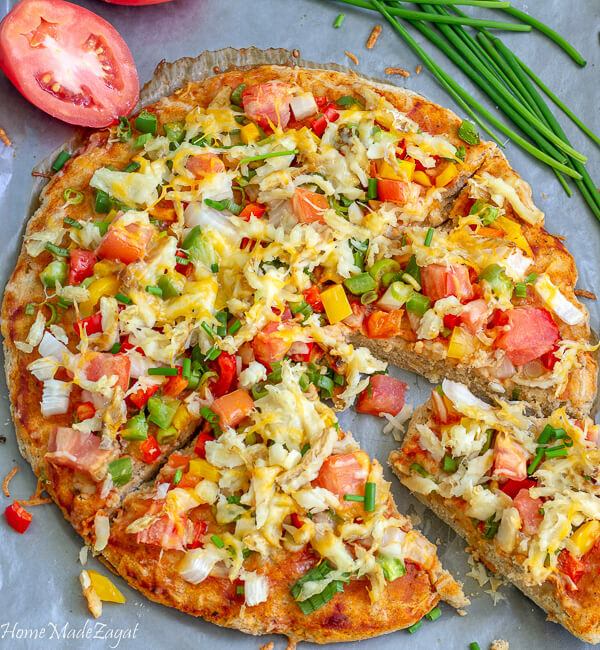 A delicious pizza combination of coconut flour crust with saltfish topping, paired with the usual condiments of a saltfish buljol. 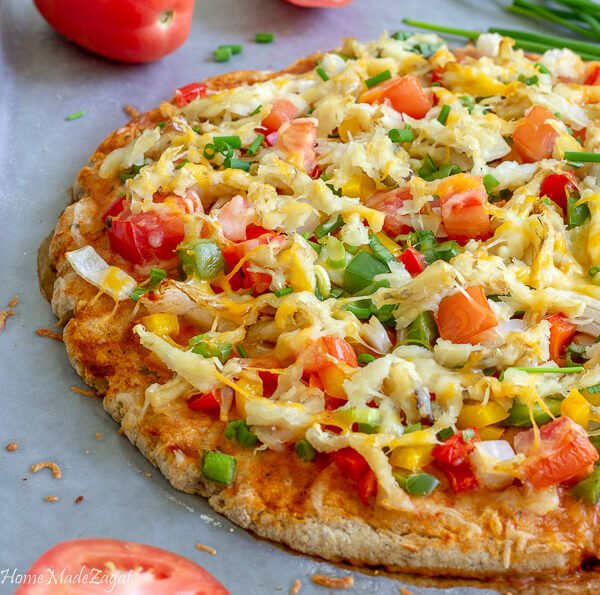 A play on the best Caribbean breakfast combo of saltfish buljol and coconut bake, this pizza had all the delicious saltfish flavor mingled with the familiar flavors of everyone's favorite guilty pleasure: pizza! 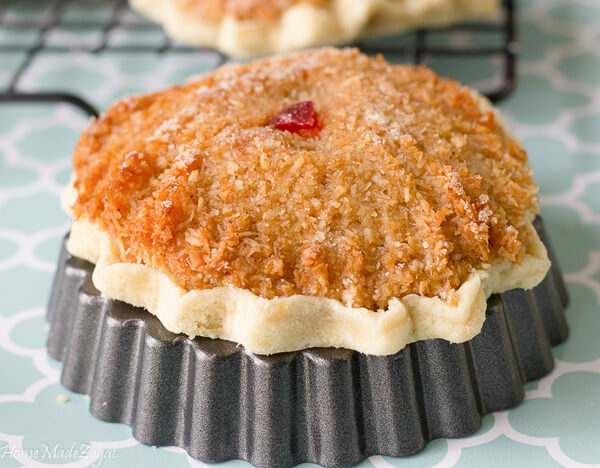 Combine coconut flour, plain flour, baking powder, egg, salt, shortening, and water together.